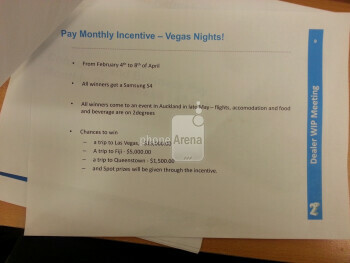 We just got a couple of photos of an internal raffle doc at a New Zealand mobile retailer that states all those who won a prize will also be given a Samsung Galaxy S IV handset. 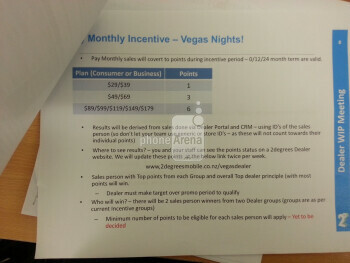 The raffle is aimed to be a sales incentive, and runs until April 8, which goes to show that we can expect the Galaxy S IV to hit the shelves some time after the first week of April. Adding more water to this rumor mill is a separate tip from a UK retailer that the Samsung Galaxy S IV is scheduled to launch 15-22 that month, or in the third week of April. Given that the current speculation is for a March 22 Unpacked event held on US soil, and even the possibility that it could be carried out on Apple's home turf in the Silicon Valley, rather than the typical NYC location, we'd imagine that US carriers won't be far behind to launch Samsung's finest this year, so mid-Spring is shaping up to be a pretty exciting period. Not so impressed with this Android phones. Checked out the LG ice Price endorsed and was below my expectation. I'll stick with blackberry. Brand_new: Not so impressed with this Android phones. Checked out the LG ice Price endorsed and was below my expectation. I'll stick with blackberry. seriously, you want to start this argument here, today?!!! gmyguy: seriously, you want to start this argument here, today?!!! Seems to me Blackberry is not dying after All. I also fell for the Android hype and got myself one. Didn't last longer then a few hours and I thank God for that or I would have been stuck with them iPhone copycats. Who cares when an iPhone rocks the android iOS world? All these manufacturers wanna drain the olojukokoros & come to think of it na slight difference the phones they get. You've been hanging out with Iphone fan boys too much. Can you please list what android stole from IOS? This will be okay for me. The best thing that can happen to the mobile phone industry is for Nokia to start using Android OS. its running jeli bean or rice? Oi! U musnt use it, don't try to buy it, nd den start beggin 4 fud. Leave it to dose who can buy it. Stick with bb..
My man, you are right! Why did nokia even go for windows when the would have silenced htc & samsung with andriod! Abi na tecno where 4 compare with nokia? Nokia made a mistake, but even with that, i think nokia would still take the lead! Ofcause the know why the took windows, i just hope the continue doing it good! This is nothing but a ploy to silence the euphoria that greeted the Blackberry 10 launch. You can can get a brand new andriod phone for less than 14k on Techno N3. So whats the big deal? Choi! Which one you buy or use before? Think I'm one of those hungry aZzzz Nairalanders, Yeye thing! Brand_new: See my puppy feeding on Milk and biscuits, see as him dey eye you like sey you sef wan chop @Ifilinwa. Nawao. . . .why your fingers come strong like this bros ? Those fingers do not look ajeboish to me o. Not my fingers and I'm not ajebo either. Those one's you see there pass the Android tapping iOS wannabe's. Been to at least three continents. Me Sef even fresh pass. What do you think BBM is for, why do you think all BB devices are hooked on the most advanced enterprise servers. Droiders redemption is WhatsApp and most of my contacts look dead all the time. Use free and pay 99 cents the next year. How many osho free Naija people fit pay the 99 cents? You buy a phone and can't even get enough data to keep it functional smh! Oya na my hand be this. Chop am! And you think the 14k low-end driod phone has the same capabilities as the G S III? You need to see a doctor. chai na your hand be dat?if u slap person ma die be dat.